Position, rank, working organization : Deputy Manager of Tailor Made Store for domestic market and export. Descended from a poor family, since my twelve, I had been come to Ha Noi for a hired job and forlearning to make clothing. Experiencing many difficulties and challenges, but with my career passion and my dream to contribute to Vietnam clothing industry and its progress to make sophisticated clothing products both traditional and fashionable withadvanced skills, helping to present the beauty and charm of Vietnamese people, I had constantly improved my skills, learned from others, made new clothing designs to serve clothing demand for domestic market as well as foreign market. Meanwhile, I had arranged many classes to teach tailoring and privately tutor high skill workers in the City and in some neighboring Provinces, creating employments for many workers whose family was also in this industry. During my career, in the previous long time as well as after liberation of the South, I have always attached to this career and not act against ethnic and conscience. My family and I have always strictly followed all principles and policies by The Party, the State, company’s regulations and local regulations. After liberation of the South, in 1976, as trading industry of the City started, I had willingly applied for tailoring job in Fabric Garment Company managed by Trade Department of the City due to my awareness of contributing to the new society. Thanks to high skills and the trust from the Company’s leaders, I have been assigned the task of running the first State tailoring store in the City located in 108, Dong Khoi Street, then Stores in 55, 61, 72, 76, 85 and 105, Dong Khoi Street, District 1, Store in 17 – 19 Le Loi Street, and Store in 72 Nguyen Hue Street. In my clothing career path, I had invited many of friends as famous and high skill tailors in the City to join in tailor group of the Company such as Mr. 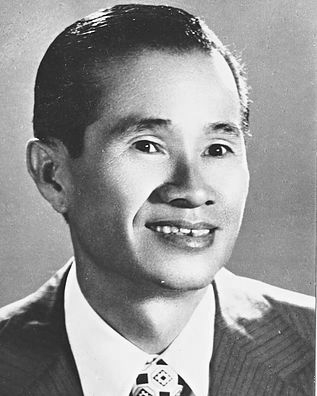 Vu Van Hung, Mr. Le Kim Bang, Mr. Tong HuuPhan, Mr. Nguyen Chanh, Mr Nguyen Van Duc, MrDinh Van Xuan, Mr Adam, etc. This corporation had helped the Fabric Garment Company to develop a wide tailor network throughout many Districts in the City, attracting a large number of skillful workers. Therefore, I had trained many tailor workers of the City as well as in other Provinces in the Country, meeting significantly clothing demand of people with dedicated service and guaranteed quality. Besides, I had also actively took part in develop focus stores ran by clever and sophisticated tailoring skill workers attracting crowed foreign and domestic customers, creating trustfulness for Vietnam clothing industry. It has been my honor to be allowed to directly make clothing for Central authorities, Department and Committee in the City, foreign expert groups and many officer groups on far mission by the City’s People’s Committee. These comrades had praised when received my clothing. From 1976 to1980, be assigned task of providing tailoring training classes for workers in the Company and other units by the Fabric Garment Company. InFebruary, 1979, organize tailoring contests for Sai Gon Export Tailoring Enterprise 3. InApril, 1979, be invited by Ministry of Internal Trade to come to Ha Noi attending Clothing Meeting to teach tailoring skills of the South. On this mission, I had been granted theCertificate of Merit No. 64/GK dated April 21st, 1979 by Director of head of the Fabric Garment Company. Also on this occasion, many Provinces asked for my help to train for their tailoring workers, but I had refused due to my short time. On September, 1979, be appointed to be a member in Examiner Association for a tailoring contest of the South by leaders of the Fabric Garment Company. In 1982, organize tailoring store managed by Department store 2. In 1984, organize the first official class to teach tailoring Vests. In this class, there were 15 learners from the Company, 20 learners from other unit and after that, there had been 10 tailoring workers at level 7 (especially 3 woman), 14 tailoring workers at level 6, 5 tailoring workers at level 5. Over 6 months of training, the outcome had represented good efforts and training methods. Then, I had been awarded theCertificate of Merit No. 38/84 dated January 01st, 1984 and praised for my teaching spirit and high teaching skills by the Company’s Director. In 1985, organize Export Tailoring Enterprise District 1. In 1987, organize two training courses of trouser and shirt tailoring for unofficial woman tailoring workers of the Fabric Garment Company. In 1989, participate in establishment of ThiSach Export Tailoring Enterprise authorized by Custom Department. On July, 1988, be honor to be offered by Ministry of Internal Trade to attend Tailoring Professional Meeting of the South as an advanced tailoring professional and a member in Examiner Association.